As spring practices continue this week for the Oregon Ducks football team, players are knocking off the rust gathered in the offseason and getting situated into their position groups. For the quarterbacks, the battle has hardly begun. One of the most dynamic candidates, former Eastern Washington quarterback Vernon Adams Jr., won’t arrive in Eugene until after graduation. 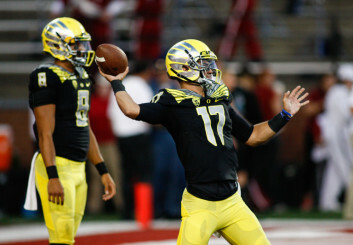 This may be a chance for junior quarterback Jeff Lockie to shine. And while some fans believe Lockie doesn’t possess the same spark that they were accustomed to seeing with their Heisman Trophy winner, there are three good reasons he could be the next Oregon quarterback. 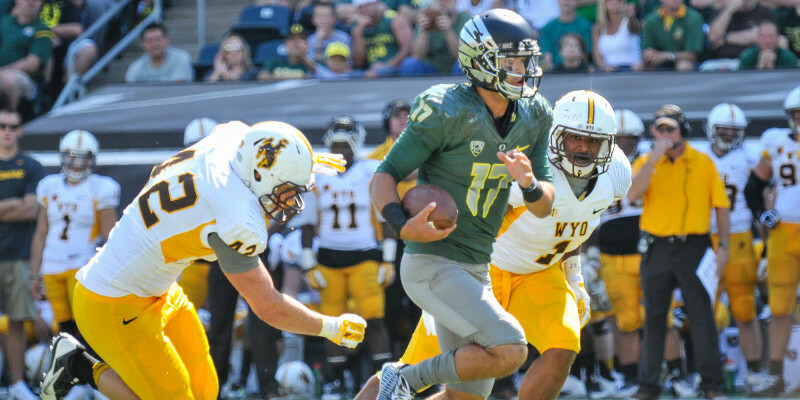 After three years as Mariota’s understudy, it’s time to see what Jeff Lockie is all about. The one thing Lockie boasts above the other quarterbacks is experience operating within the Oregon system. The Alamo, Cali. native is the only prospect in the talent pool who has put his Nike boots on the ground and taken game-time snaps under center for the Ducks. 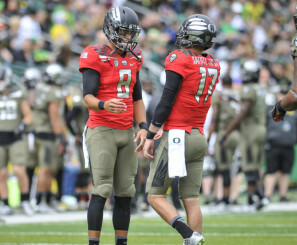 It is those invaluable moments that are the foundation for Lockie developing the necessary leadership traits of a successful Oregon quarterback. After three years in the shadows of greatness, the time is now for Lockie to take the next step and assume a leadership role, something the soft-spoken young man addressed with the media after practice on Tuesday. 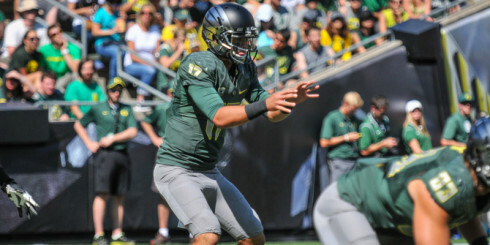 Lockie has had the opportunity to learn from the greatest quarterback in Oregon history. The opportunity to learn and work alongside the greatest quarterback in Oregon history is money in the bank. Lockie knows the time is now to grab the reigns, and that is a huge step in the right direction. “A lot of people have opinions off of a small sample and that’s completely justified, but I think my goal as a quarterback is to lead the offense, to be that leader out there and score touchdowns,” Lockie said. Mariota was cool, calm and confident, improvising under pressure and creating positive gains from broken plays. What separated Mariota from the field was his uncanny decision-making when things appeared to break down. In Oregon’s first week of spring practice without “No. 8″ in three years, it appears as if some of the Hawaiian’s demeanor has rubbed off on a maturing Lockie. Jeff Lockie had his longest rush (13 yards) against Wyoming last season. “I would have said that maybe a couple of years ago, playing with Marcus and seeing some of the plays he makes, maybe you feel you need to make some of those plays. But being here for three years, playing third-string ball, I’m far from pressing. I’m just enjoying it and trying to play confident,” Lockie said. For the team, coaches, and fans, this could be a sign that the dual-threat quarterback is comfortable and not trying to force the issue. While younger signal callers may feel a need to impress the coaches by trying to deliver one big play after the other, the real key to long-term success is consistency and not pressing things that aren’t there. The quarterback position requires reliability, control, and making good decisions under duress. If Lockie remains confident throughout the Ducks’ nail-biting quarterback race, success is likely to follow. Whether that translates into a starting position at Oregon will largely depend on him. Lockie warming up alongside Mariota before the WSU game. The frequently raised concerns regarding Lockie’s abilities are rooted in frustration over the limited exposure to the Oregon junior outside of games. While some apprehension is valid, many of the Oregon faithful simply haven’t seen enough of the 6-foot-2, 200-pound quarterback to render a final judgement. Perhaps it’s the result of continued frustration over closed practices, implemented by former head coach Chip Kelly in 2011 to instill a team-only atmosphere free from the distractions of social media, rabid fans, and the prying eyes of Oregon’s Pac-12 competitors. But that is hardly a reason to jump to conclusions over any player. “It’s kind of hard for [the media] since they don’t let you in practice anymore. I’ve probably been through hundreds of practices and taken thousands of reps. I know the public has only seen such a small amount, but that’s the way it goes and we’ll see if that changes,” Lockie said. At the end of the day, the responsibility of selecting the starting quarterback rests squarely on the shoulders of the Oregon coaching staff. Duck fans must trust that head coach Mark Helfrich‘s final determination will be based on months of exclusive evaluations and rigorous scrutiny. After all, that’s his job. Lockie’s sample size leaves a great deal to be desired, and his ongoing performance and growth will remain shrouded in mystery. But if anyone deserves the benefit of the doubt, it’s Jeff Lockie. The spring proving ground has just begun to blossom and Lockie is right in the mix. 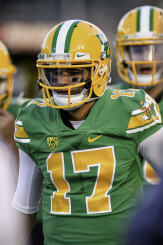 Don’t count him out as the next starting quarterback for the 2015 Oregon Ducks.